Another Edition of Easiest Plant Ever! I talked last time about the popular bamboo-looking plant, Dracaena Sanderiana. If you remember, it's a really easy houseplant. Another one that's super-easy to take care of, and needs pretty minimal light, is the Spider plant, or Chlorophytum comosum. 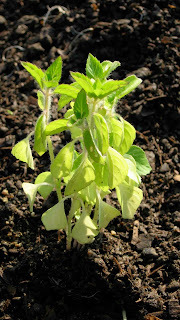 It has long narrow leaves, about an inch or so wide at their widest and narrowing to pointy tips. The leaves grow up and droop out and over the sides of the pot. I have it as a hanging plant, because of a cool thing it does. Over time, the spider plant sends out "branches" that grow what looks like a miniature version of itself at the end of the branch - those hangy things towards the bottom of the photo above. You can then pluck these little plants off, put them in water and wait for them to grow some white roots. At that point, you can actually plant that part in a new pot with some soil, and grow a whole new plant! It's a great way to share plants with your friends, as well as to populate your home with lots of greenery. Another bonus to the spider plant? They've been proven (science!) to help clean the air and help with indoor air pollution. One of the things I'm beginning to understand since arriving on the farm are the difficult economics of growing vegetables for a living. Here at EST, we have a relatively small plot of tillable land, only a couple of acres, and so we make up for that by producing a modest line of prepared foods: hummus, veggie burgers, pesto, and more. We also have to be strategic about what we plant, hence the abundance of tomatoes, green leafy things, raspberries, and the like -- stuff our CSA members love and that command good prices at market. The amount of space we can devote to unusual herbs or less popular veggies is, unfortunately, somewhat limited. But we do have some fun stuff growing here, as I've noted before, and even some trendy greens like arugula. One thing I've grown to love here is our kohlrabi, a popular vegetable among the health-conscious that is increasing available in regular supermarkets. 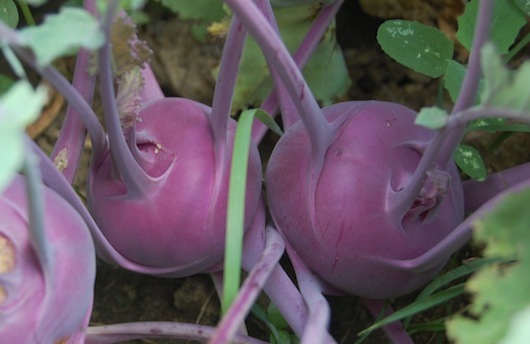 Kohlrabi has the texture of an apple and secretes a little bit of juice when bitten, but the taste is far subtler, with a little bit of radish and some cabbage thrown in. We use it in salads mostly, but there's plenty of other applications. Over the last few weeks, ours have been in full swing and it feels great pulling these fully formed baseballs from the dirt. But the thing I love most is its appearance. The variety we grow comes in an amazing shade of almost neon purple, earning it the nickname, in our fields anyway, of the Avatar vegetable. And the way the stems connect with the body resembles nothing so much as a human heart. It's smooth to the touch and sensually textured. I love just looking at it and holding it. That it's edible too is, quite simply, the icing on the cake. Each day, a few more luscious, ripe tomatos peek red-faced from around the dense green walls. I reach in and pluck them from their stems and, if I can bear to wait, wash and eat them. If I can't wait? Well, a little dirt and acid rain residue probably never killed anyone. To recap, I am a fan of plants and a fan of office-decorating and now a firm believer that plants are mood enhancers, which I definitely need at work. This means that, of course, I absolutely must have plants in my office. So when we moved back to New York City from Mexico and I went back to my desk, the first thing I did was call Flowers by Richard, because I know they deliver plants to offices. Not only that, but the last time I had a plant in my office, I damn near killed it. Luckily, Flowers by Richard came to my office with a watering can, scolded me for overwatering my plant and gave it a new plant basket. Point is, I am pretty sure I'm going to need Flowers by Richard to come and check on my plants when I almost kill them again. I sprayed the plants' soil morning and night until the bugs disappeared. And now they're gone! I actually had a little bit of a bug resurgence with a different kind of flying bugs emerging from the Evergreen, but I sprayed it down with more of the magic dish soap spray bottle and now the new bugs seem to be gone too! Hopefully they're gone for good. I'll be back with "learning how much water is not enough and how much water is too much when watering your plants" because I'm having problems figuring that out right now. Wish me luck as I try not to kill my plants and wish my plants luck in staying alive! As Ellie noted earlier this week, it's tomato time in farmland. Here at Earth Sky Time, tomatoes are our cash crop. They cost us much in time and labor and greenhouse to raise, and yet we manage to sell our gorgeous tomatoes by the truckload. We've had fruit for nearly a month now, but in the last two weeks, the greenhouses have exploded. Nothing else on the farm compares in terms of sheer variety and abundance. Green zebras that shimmer in their lime green stripes. Brandywines and Paul Robesons and Cosmonaut Volkovs. We have heirlooms rippling into mutant shapes and enormous bright red sumptuous softballs of juicy bliss. 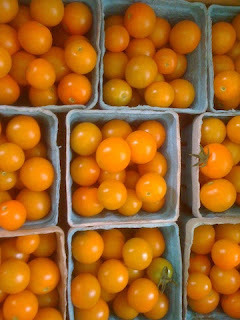 And then there are the sungolds, the crown jewel of our modest tomato kingdom. How I managed to never notice this incomparable plant before this year eludes me. These yellow-orange cherry tomatoes explode with the sweetest nectar of any tomato I've ever had. I routinely tell people at the farmer's market that they are magical creations. I have no idea if they believe me or not, but they always buy them. It's not hard to understand the appeal. Tomatoes are bright and colorful, juicy and sweet. Their appeal is instantaneous, but also unsubtle. We have many unique vegetables growing here, but like a Tolstoy novel or a Radiohead B-side, they take a little effort to appreciate. Tomatoes do the work for you. Which is not to disparage my beloved sungolds. They bring me ample pleasure on a consistent basis. But having read recently that Americans consume less than one percent of the foodstuffs available to them, it's probably best to spread the wealth around a little. I am the opposite of a farmer. I am a corporate lawyer. I spend my days (and many of my nights) in a flourescent-lit office with gray carpeting, mostly looking at my computer screen, with the occasional glance out over the Hudson River. It's a pretty nice office, don't get me wrong. And I do love to decorate it, since I basically live in it. Anyway, I love plants. I'm terrible at taking care of them, but I love them. Mostly I like how they look. And I like the color green. When Zack and I were in Japan for our honeymoon, my older brother booked a tour guide for us as a wedding present. The tour guide was named Mr. Nakamura, and he was like a fountain of zen wisdom. He wore a finely pressed suit in the merciless heat and drove an immaculate town car with doors that opened by themselves, which he kept stocked with moist towelettes for our comfort. (If you have plans to visit Kyoto, let me know and I can put you in touch with him!) Nakamura advised me to change my computer screen wallpaper to a photograph I was taking of this amazing green moss. He said that looking at green things is a natural mood enhancer and that it was good for the eyes, which would help to balance out the eye damage caused by staring at the computer. He also said, mysteriously, to avoid the number two and always go with three, but that's neither here nor there. Needless to say, I took the Nakamura very seriously. I am extremely impressionable. But I also think it makes sense that it's good to look at green things, right? Plants and humans complement each other with the whole oxygen-in, carbon-dioxide-out thing, so this is another iteration of that concept....except I guess humans also kill plants a lot (on purpose, and by accident, like me) so I guess there's a limit to the perfect order of the universe. Check back in a few days to find out what happened when woman and nature collided high above mid-town Manhattan! For the past six and a half of years I've had the privilege of living in a 100 year old house in West Philadelphia. Earlier this summer the owner informed us of his decision to renovate and sell the house, and over the last few weeks, in between times up here at camp, I've made trips home to clear out. 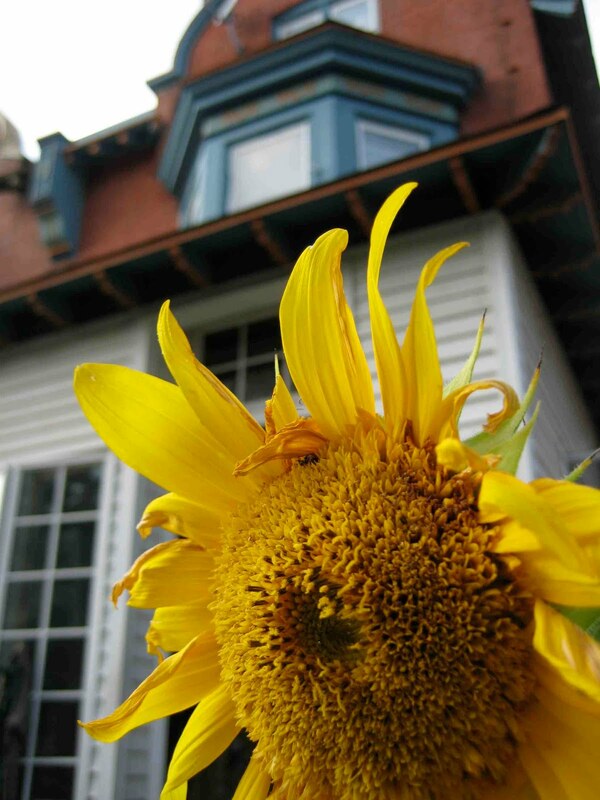 The house has been good to me-home to many wonderful people, travelers passing through, and long-term roommates. We've hosted dozens of potlucks, a handfull of workshops, dance parties, and cuddle puddles. Every year since I've lived there we've kept a garden out front. The space isn't huge, but we've packed a lot in there. At last count, there were over 25 varieties of herbs and vegetables, including tomatoes, corn, basil, sunflowers, rosemary, amaranth, nasturtiums, and crab apples. For the past two summers, I've been away for July and August. I've put in a lot of effort into getting things rolling in the spring, only to disappear in the heat of the summer. My sporadic returns always lead to a surprise revisit to the garden-as I approach the house I wonder what awaits me. With regular travel, I've taken a fairly hands off approach to this garden-often allowing volunteer tomatoes and sunflowers to take root wherever they happen to appear. Last August when I returned home I was tempted to start weeding and cleaning out some of the beds. After 10 seemingly useless minutes I had the distinct thought that August is a terrible time to try and tame a garden. Last week I came home to get the last of my things out of the house. I was excited to see what was growing and what had survived the drought we've been in. I was pleased to see the Blue Hopi Corn was doing well, as were some volunteer sunflowers. Most of the tomatoes had died, but one was giving off fruit. The perennial herbs had survived the dry spell and the scaffolding of the contractors, and I clipped them to take cuttings to my new home and farm. The moving out has been a little hard. I love this house, and had always envisioned moving on with more grace than the current situation is allowing for. So I snapped a few photos of the garden, and felt good about leaving this home with a 12 foot sunflower out front. This week brought the first tomatoes of the season. That sentence should look more like: THE FIRST TOMATOES! It is probably the single most incredible farming experience to spot that first red fruit amidst all of the green leaves and green tomatoes yet to be ripe. And then the scent of it. Holding the soft fruit to my nose, the tomato smells of earth and rain. The joy of this actually gives me the chills. It seems that tomatoes also hold childhood in them -- the feeling of summer and freshness and something young. The giddiness I have for the first tomato is a re-experiencing of how it felt to be a kid with joy for the simplest things. 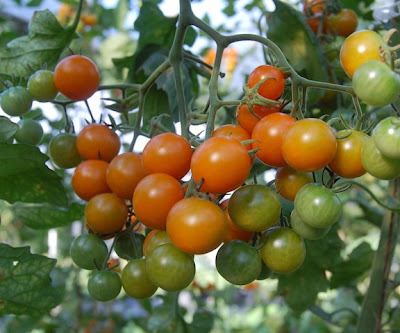 Behind these sensory experiences, lies all of the hard work that has gone into each tomato plant -- seeding them in February, potting them up in April, planting them in the field in May, trellising them in June, mulching and pruning them in July. They start out as tiny seeds and as if by magic they are six feet tall heavy with pounds of fruit, full of potential for sweetness and tartness and the slight acidity they will leave on your tongue. They have names like poetry -- Aunt Ruby's German Green, Black Prince, Cherokee Purple. I ate a slice of my first tomato this evening-- a Pink Brandywine, split open at the bottom with all of its juice. Alas, we've run into one more snag... our little pepper plants, which are decidedly dwarfy but producing lots of veggies, have been getting mysterious brown patches on otherwise perfect looking specimens of young pepperdom. World Vegetable Center would have me believe that this is actually a phenomenon called sunscald, in which our peppers are essentially getting sunburned from exposure to intense sunlight and temperatures. Again, the roof is a frying pan! Our peppers are getting destroyed by their leathery tans, aging prematurely. We may try to introduce a little artificial shade up there, or perhaps more sunblock and visors. On a side note, I was so taken with the logo for the World Vegetable Center that I did a little research on other logos connected to international vegetable initiatives, and found that they generally are suggestive of global creepiness! Here are just a few, for your paranoiac viewing pleasure... Just another reason to grow your own. Tune in next week when I try to get to the bottom of the real difference between a fruit and a vegetable! Dispatch from the SF Photo Dept. If you're ever in San Francisco, you should make it your beeswax to check out the plant shop Flora Grubb. Why? The most jaw-droppingly novel arrangements of plants I've ever seen. I recently made the trip out to Bayview (which also contains one-third of San Francisco's toxic waste) to explore the garden. To my delight, Flora Grubb has plants growing out of bicycles, sinks, and cars, and a "vertical garden" out of which colorful succulents sprout. More of a crafter than a gardener myself, it inspired and reminded me to think of plants not just a means of nutrition, but as living entities that can be used in unexpected ways to beautify spaces and objects. Boy oh Boy! Backyard Garden! As the summer goes on, and the sun is just blasting away, I can't help but get more and more excited. Not with the 2 to 3 times I have had to water each day and not with the constant staking and re-staking of my insanely huge tomato plants (see photo below) Farmers...how do you do it?? I can't imagine dealing with hundreds of these beasts. Mine are on their way to being well over 6 feet, and show no sign of stopping. What I'm excited about is that upon closer inspection, the rewards start showing themselves...much like lots of things in life, I guess. There's at least 20 green tomatoes of various sizes and plenty more on the way. That's the first green pepper of size to show it's lovely face, and my mouth is just watering thinking about biting into it's crisp coolness. Some years ago, before the obsession with all things local and organic became a full blown national epidemic, I was at a dinner party in Cambridge, Mass., when our hostess emerged from the kitchen carrying a platter of a limp-looking green vegetable. "Mmmmmmm," murmured our table filled with right-thinking progressives. "Steamed kale!" Only in Cambridge, I thought, could a relatively obscure and much-maligned leafy green elicit oohs and aaaahs when paired with nothing more than salt and vaporized water. Today, I've grown to love kale, so much so that its very name has become synonymous with my own farming enterprise. When folks would ask why I was leaving New York for Vermont, my deadpan response was, invariably, "To grow kale." Still, making the green taste as good as it feels -- kale scores virtually off the charts on health benefits, protecting against everything from lung cancer to arthritis -- can be a challenge. It's tough to the touch, occasionally bitter, and breaking it down into more digestible format without destroying its nutritional qualities takes a bit of kitchen savvy (though really only a bit). So I was amazed to discover this week purple kale that is amazing to eat raw. Seriously, I chewed it right out of the ground and it was delicious, no prep necessary. You don't even have to massage it. The secret? Pick it young, an option you'll most likely have only if you grow your own. Ours is perfectly ripe this week -- luxurious, green-stemmed, soft to the touch, antioxidant-bursting kale. No steaming necessary. The luck of the Irish must reside deep within this here shamrock. With the beating sun, lots of water, and just a little bit o'luck, it's growing like I've never seen. The little pink flowers open up wide during the day, and as soon as the sun starts to sink over the building-created horizon, they close up tight. It's so great to see this awesome resurrection of an all-but-dead plant. Party on the Farm, Party on the Farm! Monday was the first ever Farm Festival at camp. We announced it to the campers the previous night, sparking a 10 minute, camp-wide, "Party on the Farm" chant. 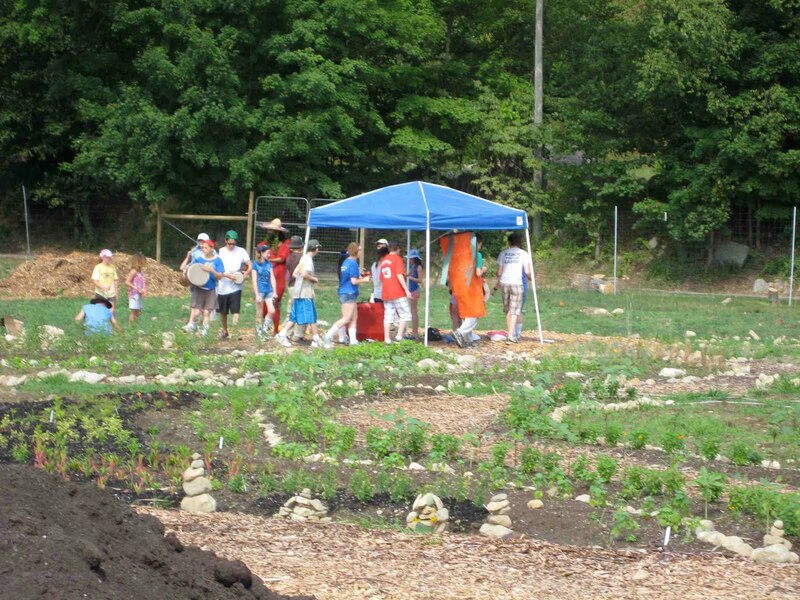 The day was awesome, and included stations where the campers learned about harvesting and social justice, weeded beds of radishes and squash, made beautiful vegetable signs for the farm, and helped to build more beds in the calendar garden. After all campers rotated through, we held the first ever Farm Olympics Relay, where the entire camp worked together to set a new world record. Events in the relay included "Synchronized Grazing," "Farm Haiku Writing," and the perennial crowd favorite, "Compost Cycle Challenge!" But the day had started on a more somber note. Monday was Rosh Chodesh, the first day of the month of Av on the Hebrew calendar. 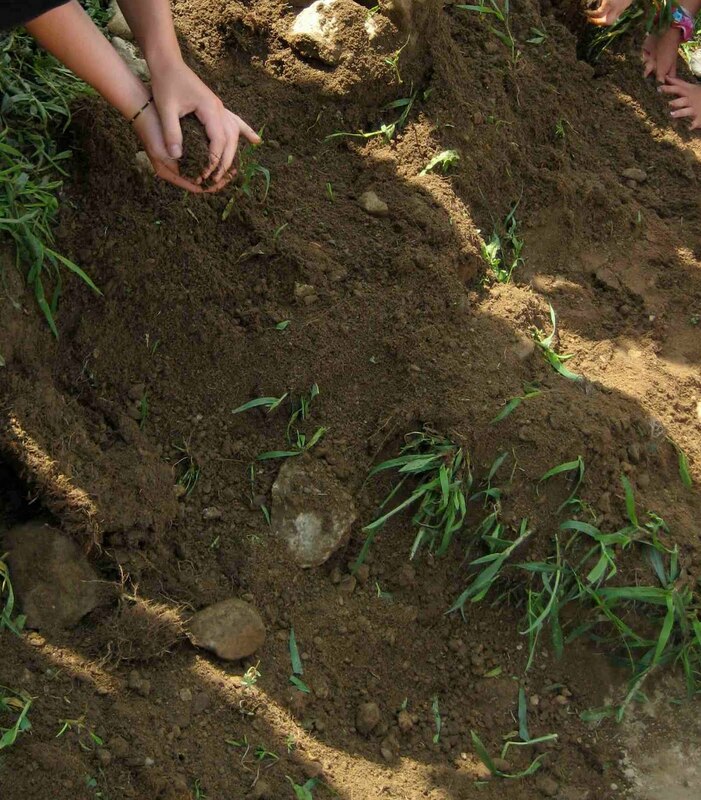 We marked Rosh Chodesh Av by placing a giant rock in the Av bed of our Jewish Calendar Garden. We spoke about the month of Av, and the long history of devastating events during this month, historically as well as in the modern era. We also shared how after the 9th of Av, when we commemorate the burning of the Temple in Jerusalem, the energy of the month shifts, and we embrace the growth that can follow destruction. 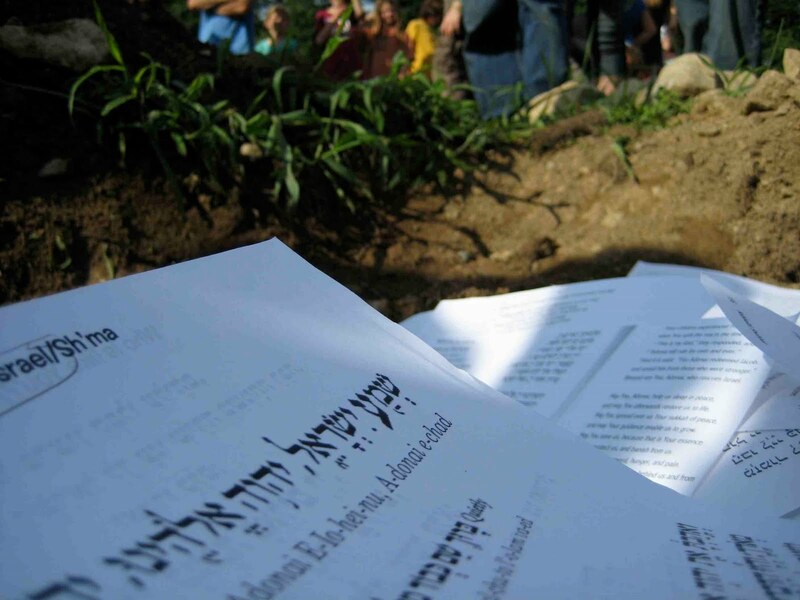 We used this special moment for the practice of Genizah, burying documents containing the name of God. Each camper placed one of these sacred pages into a giant hole in the Av bed, and then we slowly covered them with soil. As we move through the intense heat of the summer, when we stand in awe of the destruction in the world today, we must always remember that beneath the soil, there lies the potential for renewal. Oh yeah, and we also had a parade through the farm with one camper wearing a giant carrot costume. The last couple weeks have been hot. Not your regular late June, early July introduction to sunshine and summer, but a sweltering heat wave that's turned our un-air-conditioned loft into a soupy Bikram studio for unhappy cats. Really brutal record-breaking heat, the blazing sun in a cloudless sky, air still and thick and everything sticky and clinging. And our roof, with it's full exposure and slightly reflective surface, has been doing a pretty good impression of a frying pan. We've had to double the amount of water we give the plants, finding them wilted and fried at the end of the day. But everything is hanging in there, for now, we all just look a little worse for wear. So we went ahead and harvested what was left, pulled up our fried and embittered stems, and sowed a new batch of lettuce seeds. Hopefully we'll see some fresh little green leaves sprouting soon, and maybe it'll cool down just a little. There have been some breaks in the heat, but it looks like we are in for a long, hot summer. Bite off just a little from the tip, chew it 10 or 15 times, spit it out. You'll love it. That's usually how I introduce newbies to spilanthes, one of the more unusual things we have growing in our herb garden. As a commercial farm, one with a hungry family and as many as 10 farm interns to feed, we have little ground -- not to mention little time -- to experiment much. But we do have a few things we plant more or less just for fun, and spilanthes are one of them. I can't really recommend growing them for seasoning purposes, though Wikipedia says it's possible. They don't taste particularly good to me. More commonly, spilanthes are known as a toothache remedy. After a few good chews, my mouth experiences something akin to biting into a huge lemon, though much more enjoyable (to me anyway). My tongue tingles, the roof of my mouth goes dull, saliva pours out, and invariably I wind up with a huge smile on my face. In these days of renewed interest in all things local and organic, and in an economic climate where small farmers rely on cash crops like tomatoes and raspberries to generate income, there's not often room for fun stuff like spilanthes -- unless you have some crazy scheme to corner the market on natural dental anesthetics. But if you have the room, or can get your hands on some (you can buy the seed here, described as "highly entertaining"), bite a little off, chew 10-15 times, and spit it out. Last we checked in, our rather heroic efforts at establishing a little beachhead of green growing goodness on our windy and wet wooftop had been woefully unsuccessful. The majority of the seedlings we lovingly raised from scratch had bitten the dust, or rather, the mud, unable to withstand the cold and rain that greeted them as they made their debut high above the tenements of Bushwick. As we surveyed at our barren buckets, it was hard to envision starting again, or ever getting anything to take. But out of nowhere, a quiet refrain rose up in my head, growing louder and more persistent, till it was ringing out over the rooftops, ruffling the feathers on the pigeons roosting across the way, waiting for their chance to ascend into a swirling column of avian synchronicity. What've we got? We've got heart! All you really need is heart! When the odds are sayin' "You'll never win," that's when the grin should start! We've got hope! We don't sit around and mope! Not a solitary sob do we heave, mister 'cause we've got hope. 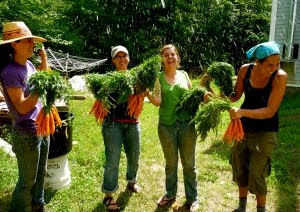 See this picture of me and the farm apprentices celebrating beautiful bunches of carrots? The joy, the beauty, the bounty. Looking at us you would never guess that two months before we were on our knees, for hours at a time, thinning miniscule carrot plants. Thinning? Yes, thinning. Carrots have a notoriously low germination rate so when you plant them you have to put a lot of seed down. Which means that when they sprout you get a thick row of them that then need to be thinned to about an inch apart, to make room for a full grown carrot. If you don't thin them, you'll get thousands of smushed tiny carrots and none of them will get big enough to eat. You also have to hand-weed as you go. It's a slow, sometimes tedious, sometimes meditative process, that makes you really, really appreciate the carrots when you finally harvest them. Carrots were the first thing I seeded in the ground this season (on April 1st) so they carry a special magic. And as a first-time farm manager, I watched over them intently, coming out every day to see if they had germinated, not quite believing that they would. And then came a heat wave. Our irrigation wasn't set up fully so in moment of stress, I came out to the fields and started handwatering them in with a watering can. I needed to save the carrots. About a hundred feet down the bed I realized it was ridiculous, that I would be out till midnight at the rate I was going, and I would have to accept that I might lose them to the heat. By the next week, the carrots had germinated beautifully. Maybe all of my anxiety was actually a growth-promoter. And now in mid-July, we are at the tail end of another long heat wave, and we are harvesting those carrots I watched over like an anxious mother. There is nothing quite as sweet. Over the weekend, one of our campers came down with a bug. Her father, Baruch, is on our farm staff and is a master herbalist. He has spent much of the past few days at her side, providing her support and love. As you can imagine, this can be somewhat draining. At the same time, many of the herbs that we had started in anticipation of his arrival to camp, desperately needed to get in the ground and Baruch was eager to spend sometime in the field. The days this week have been hot and dry, and the plants on the field are thirsty. Mid-day is a hard time to be in the direct sun, but evenings have been cool and breezy, and sunsets have been rejuvenating and refreshing. So around dusk on Sunday, Baruch came out to the field to plant some Evening Primrose and Echinacea. A few years back, when I was on Oz Farm in northern California, Baruch came to lead a plant walk for the group of students I was with. He said that in herbal medicine, we develop relationships with plants and their healing qualities that are very different than the relationship we have with more Western medicine. He shared that once he has a deeper connection with a particular plant, he no longer needs to consume it to benefit from its medicinal value. He can simply sit next to it, or even think about it, and immediately begin to feel its effects. On Sunday, Baruch sought some healing, not only for himself, but also for his daughter, simply by planting the herbs he cares so much about. By placing himself back in his element, he was able to draw strength from the plants, and have more strength to share with others. We all wish Baruch and his daughter the best and are sending out vibes for a quick and speedy recovery. P.S. The plant in the picture is Tulsi, known for its healing qualities in Ayurvedic medicine. Lately it feels like we've hit summer's sweet spot. After weeks of harvesting mainly hardy green leafy things, every day now the earth seems to offer up some new pleasure. 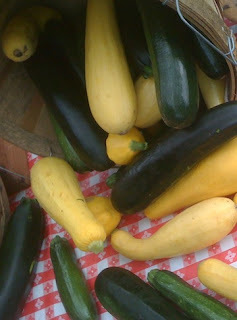 Last week we began harvesting our squash and zucchini plants, which seem to replenish our supply every 48 hours or so. 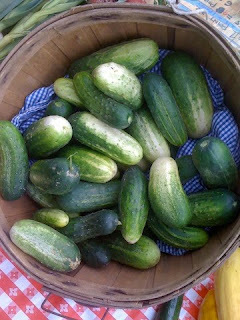 We've got our first cukes of the season. The raspberry bushes are beckoning us to weekly scavenging expeditions. 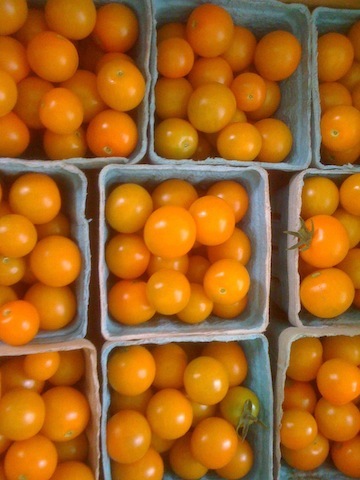 The sungold tomatoes in the greenhouse are in high gear, the taut yellow skin yielding juice that tastes like candy. Flowers are blossoming, the herb garden is singing, and the rainbow chard is doing its name proud. Back home, I got used to wandering into the supermarket more or less any week of the year and buying all of the above. Now, I get it when nature feels like giving it to me. It's decidedly less convenient -- a raspberry cobbler would have been really nice three weeks ago, and really impossible -- but somehow more special too. In a few weeks we'll start to get our melons and our eggplants and our peppers. They'll have their moments in the sun (and in our mouths) too. And knowing we can enjoy these things only during the short window nature allows makes the experience all the sweeter. That's right - say hello to these little guys who showed up in the past few days. I was away for this past weekend, and when I got back, I noticed the first couple tomatoes showing their lovely green faces. The plants themselves seem to shoot up a few inches every other day, with more and more little yellow flowers getting ready to turn into lots and lots of fruit. At this point, there's not a heck of a lot to do for them - water often, as I understand they like lots of H2O, and keep them connected to their respective stakes. I've done a so-so job of pruning the various little branches in order to maximize yield, but I'm not so sure I've got it quite down yet. I'm just so excited to bite into that first juicy tomato!